Do you drive a Chevrolet and are tired of paying dealership rates for service and repair jobs? There is an easy solution to this problem – simply call Mastertech today for all of your Oceanside Chevy repair needs. We have a team of A.S.E. 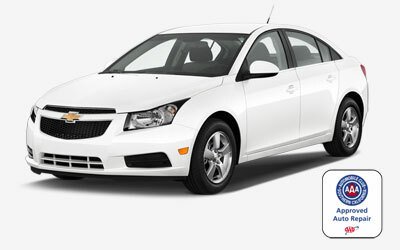 Certified Technicians that are all experts in the care and maintenance of Chevrolet cars and trucks. We will save you money over the dealership prices while still maintaining a top quality level of workmanship. It is important to care for your Chevy on a regular basis if you want to get the most value from your investment. Things like service visits and oil changes are great for avoiding a major breakdown somewhere down the line. Also, the team of A.S.E. Certified Technicians here at Mastertech can help if you have been in an accident or had some kind of breakdown and need immediate repair work. Whatever the issue with your Chevrolet, Mastertech will have the answers you need. Despite the numerous Chevy models on the road today, Mastertech can work on each and every one of them. Our track record includes the Cruze, Malibu, Spark, Camaro, Silverado, Equinox, Impala, Traverse, Volt, Tahoe, Suburban, Corvette, and many more. Since we have been in business for almost 20 years, there isn’t much we haven’t seen. Bring any Chevrolet vehicle to Mastertech with confidence that we are the experts in Oceanside Chevy repair. We hope you choose Mastertech for all of your Oceanside Chevrolet repair needs!